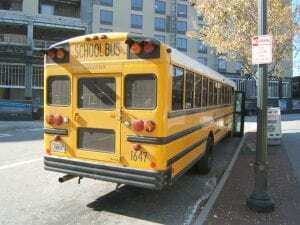 Rush, NY (March 19, 2019) – A car was reported to have passed a stopped school bus, subsequently hitting a 10-year-old girl who was crossing the street on Tuesday morning, March 19th. According to the Monroe County Sheriff’s Office, the accident took place at or near the intersection of East River Road and Telephone Road. The school bus was reported to have made a left turn off Telephone Road onto East River Road, where it stopped in front of a home with its flashing lights activated. A vehicle that may have had trouble stopping due to slippery roads then passed the stopped bus and struck the fourth-grade girl attempting to board it. The victim was able to stand up after the accident but was rushed to Strong Memorial Hospital to be treated for any injuries. At this time, the specific condition of the girl has not been stated. The driver of the car was issued tickets for passing a stopped school bus and driving too fast for the road conditions. Our most genuinely heartfelt sympathies are wholeheartedly extended to the victim and her family, first and foremost. We currently maintain hope for her full recovery. Pedestrian accidents in New York are often injurious or fatal, especially those involving children, as there is no protection between the vehicle and the victim. Moving forward, it is absolutely imperative for the victim and victims’ loved ones to understand that they may likely have very significant rights at this time. Our New York accident attorneys at Hach & Rose have dedicated their lives to helping those who have suffered due to the actions of reckless drivers. We realize that there is nearly nothing as difficult as dealing with the aftermath of a sudden injury, and we are here for you 24/7 to answer any questions you may have at this time. If you or a loved one has been hurt in a pedestrian accident due to another party, please don’t hesitate to call 212-779-0057 today.